E.T. the Extra-Terrestrial in his adventure on Earth captured the hearts of tens of millions, becoming a cult classic. This new story begins where the film ended, as E.T. 's ships is rising into the heavens. In his wonderful new adventure, E.T. goes home to his beloved Green Planet, filled with strange and fascinating creatures. But he's lonely. E.T. misses Elliott and the good days on Earth... living in a closet, drinking beer, and wearing a wig. Reading reveals: Hard to imagine now, but established author William Kotzwinkle's novelization of Steven Spielberg's E.T. 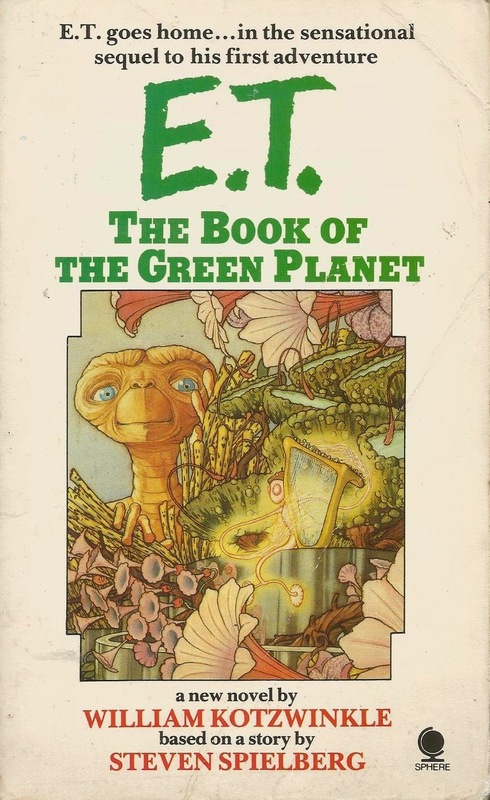 The Extra-Terrestrial was the biggest-selling novel of 1982 in the US. Spielberg was so impressed by Kotzwinkle's take on the story, complete with the dubious addition of E.T. falling in love and lust with Elliott's mom, he gave him the task of puffing out his own vague ideas for a sequel into an original novel. I actually purchased this when about nine years old. I don't think I ever finished it. I remember being overwhelmed by the task of trying to picture what was described, as E.T. returns to his home planet and encounters all sorts of strange life-forms in mind-blowing environments. Still, the book haunted me. Would reading as an adult be a more fruitful experience, my mature mind more up to the challenge laid down by the text? The answer is no. It is dreadful. The human characters, whose day-to-day lives E.T. clumsily interrupts with telepathic messages, bear virtually no relation to their movie counterparts, while the alien creatures E.T. hangs out with, actually giant sentient plants, are called things like Jumpums, Flopglopples and Beeperbeans and are as irritating as their names suggest. My nine year-old self was right to give up on this. You should listen to him. But please first purchase the book via the link provided below as I get a percentage.